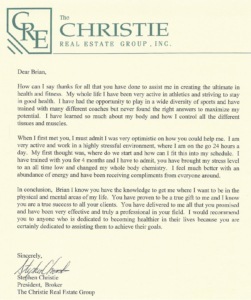 How can I say thanks for all that you have done to assist me in creating the ultimate in health and fitness. My whole life I have been very active in athletics and striving to stay in good health and fitness. I have had the opportunity to play in a wide diversity of sports and have trained with many different coaches and personal trainers but never found the right answers to maximize my potential. I have learned so much about my body and how I control all the different tissues and muscles. When I first met you, I must admit I was very optimistic on how you could help me. I am very active and work in a highly stressful environment, where I am on the go 24 hours a day. My first thought was, where do we start and how can I fit this health and fitness program into my schedule. I have trained with you for 4 months and I have to admit, you have brought my stress level to an all time low and changed my whole body chemistry. I feel much better with an abundance of energy and have been receiving compliments from everyone around. In conclusion, Brian I know you have the knowledge to get me where I want to be in the physical and mental areas of my life. You have proven to be a true gift to me and I know you are a true success to all your clients. 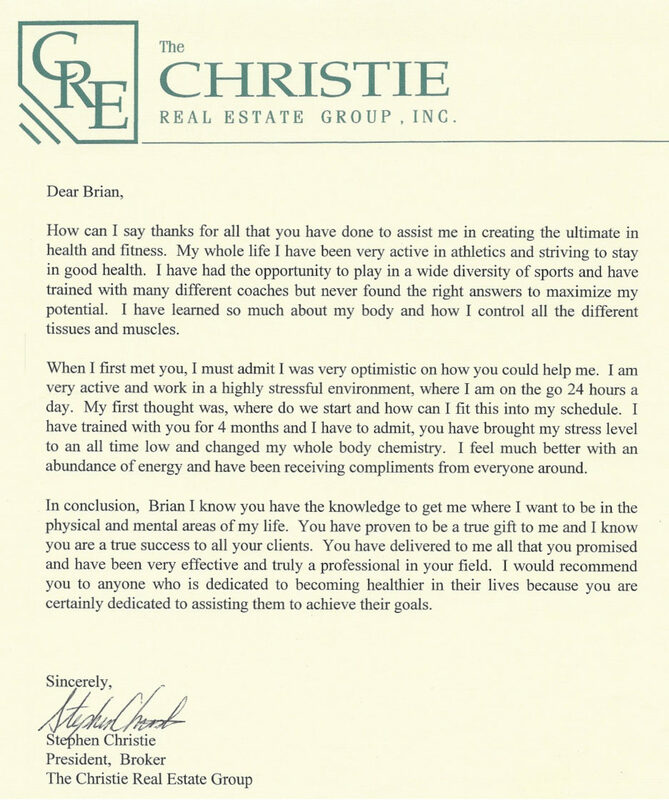 You have delivered to me all that you promised and have been very effective and truly a professional in your field of health and fitness. I would recommend you and your training program to anyone who is dedicated to becoming healthier in their lives because you are certainly dedicated to assisting them to achieve their goals.